At long last, handsome Ayodele Balogun, owner of a small Nigerian restaurant in Brooklyn, will wed his beautiful fiancée, Adenike, and they will start a new life together in the United States. Their traditional Yoruba wedding culminates in a ceremony where Adenike is named for her yet-to-be-conceived son, George. 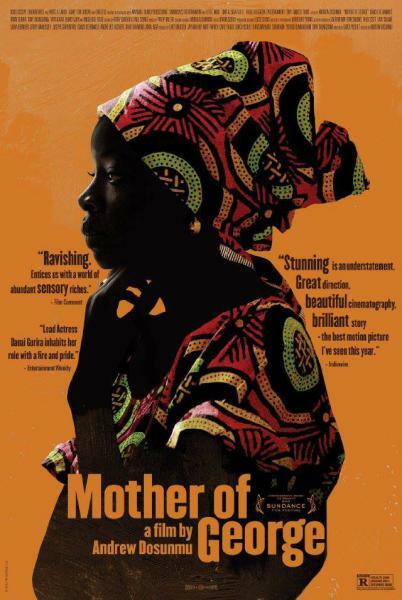 But as the months pass without pregnancy, Ma George is torn between her Yoruba culture and her new life in America as she faces uncomfortable and unfamiliar choices in her struggle to save her marriage. Director Andrew Dosunmu returns to the Sundance Film Festival (his film, Restless City, screened in 2011) with this astonishingly radiant portrait of Nigerian immigrant family life. Featuring soulful performances by Isaach De Bankolé and Danai Gurira, and opulent cinematography by the award-winning Bradford Young, Mother of George is a singular cinematic accomplishment that elevates this illustration of the complicated challenges of African immigrant life to a place of beauty and reverence. – S. F.